I pulled a bit of a noob stunt. 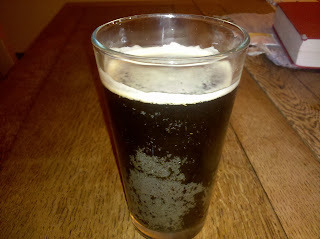 I turned the pressure up on the Koko Brown Clone to 30psi to carbonate it quickly. We were leaving on vacation, and I thought I should get some CO2 into it before we left. My plan was to turn it down to serving pressure as we were walking out. Yes, I forgot to turn down the pressure, and we went out of town for five days. Our return time was dead-of-night, and I was way too exhausted to think about the beer fridge when we got back to the house. When I woke up, though, the first thing I thought of was my little experiment. I headed out to the garage to see how it was doing, and there sat the CO2 tank, proudly guarding the kegerator, its dial sitting happily at 30psi, its gas-out line dutifully running through the hole in the side of the fridge. And inside the fridge? My precious Koko Brown with more volumes of CO2 than your bean-eating neighbor has in methane. All is well, though. I took it inside, warmed it up over the next 24 hours, and kept releasing pressure. Of course, to know when I had just the right amount of CO2, I had to keep tasting it. Homebrewing can be dirty work, but it's a sacrifice I'm willing to make. Suffice it to say that Batch 2 is very tasty. I'll have to figure out how to filter out the coconut bits, but at least this way you know it's not fake coconut flavoring.